Projects aim to preserve diverse swath of land at eastern edge of N.Y.
NEW LEBANON, N.Y. -- A pair of conservation projects now under way in New Lebanon aim to preserve a diverse swath of land along New York’s eastern border while also highlighting the town’s Shaker heritage and its pioneering role in the development of herbal medicines. The two separate projects would protect a large area of upland forests as well as lowland wetlands and meadows to the south of New Lebanon’s commercial center on Route 20. In addition to protecting the environmental and scenic qualities of the largely undeveloped and biologically diverse area, the two projects are intended to open the land to public access for hiking and other forms of passive recreation. Although the two projects are technically separate, they involve contiguous land areas and are connected in other ways. The combined site includes an area known as the Shaker Swamp, just south of the intersection of Routes 20 and 22. It extends east to Mount Lebanon. Another section extends up the hillside to the upland forests around the former Shaker community on Mount Lebanon. That area is now the site of Darrow School, the Shaker Museum/Mount Lebanon and the Abode of the Message, a Sufi community and retreat center. To the south, the planned conservation area extends into the town of Canaan to the campus of the Berkshire Farm Center and Services for Youth. The projects also tie in with a larger overall effort by New York state, environmental organizations and others to protect land along the Taconic mountain range, which extends along the New England border from southern Vermont to northern Connecticut. This region contains one of the largest remaining areas of contiguous forest and natural habitat in the eastern United States. The two projects in New Lebanon are being pursued by a collaboration that includes the state Department of Environmental Conservation, the Columbia Land Conservancy, and the Shaker Swamp Conservancy, a community-based nonprofit group. Other organizations and supporters of the effort include private landowners and the Shaker Museum/Mount Lebanon. One of the projects, known as the Mount Lebanon Forest Legacy Program, is using $1.9 million to buy conservation easements on about 1,300 acres of mainly forested upland. The funds are coming from the federal Forest Legacy Program, a national program run by the U.S. Forest Service that aims to protect environmentally significant forests that are vulnerable to development while keeping them open to careful timber management and harvesting. The other project is being spearheaded by the local Shaker Swamp Conservancy. Its goal is to preserve the area known as the Shaker Swamp and open up key sections of this complex of wetlands and meadows to public access through a system of trails and boardwalks. This project also would include an educational component, with kiosks and other features to explain the environmental and historical features of the area. A related goal is to create access points on the edges of the Shaker Swamp to connect with trails on the Forest Legacy lands. The combination of the two conservation areas ties together several aspects of the local environment and the history of New Lebanon. The Shaker Swamp is considered a unique environmental resource, with a diverse ecosystem that includes a wide variety of vegetation, including rare plant species and herbs with natural medicinal qualities. It also is home to varied wildlife, including rare butterflies and dragonflies, among other species. One reason for the swamp’s unusual characteristics is a natural thermal mineral springs located in the northern section of New Lebanon. These springs feed water into the swamp. In the area’s earliest history, Native Americans, especially from the Mahican tribe, are said to have become proficient in using medicinal herbs from the swamp as natural remedies. White colonial settlement of the area began in the mid-18th Century. 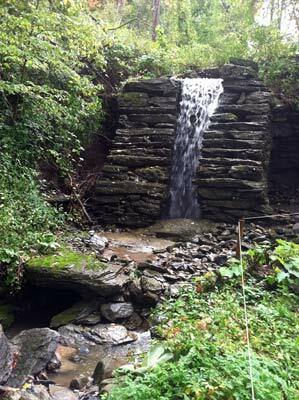 From the 19th to the early 20th centuries, the Lebanon Springs were a major attraction for visitors. Several hotels and a spa were established in that part of town. Another major influence on the town was the arrival of the Shaker religious sect in 1787. The Shakers established their largest and most prominent community in the United States in New Lebanon. At their peak, the Shakers owned 6,000 acres. They declined in the early 20th century and sold the last of their lands in 1947. In the late 18th and early 19th centuries, the Mahicans taught the Shakers about medicinal herbs that grew in the swamp at the base of Mount Lebanon, and the Shakers developed a business cultivating and selling them. New Lebanon’s role in the medicinal herb industry was amplified in 1824, when a member of the Tilden family, which had a farm adjacent to Shaker land, founded the Tilden Company, which is believed to be the first pharmaceutical company in the United States. Using techniques learned from the Shakers, the Tilden Company cultivated and sold herbal medicines on a large scale. It produced these medicines using indigenous plants as well as some it imported to the area. The Tilden Company, which also branched out into producing other forms of medicine, remained a mainstay of the local economy until 1961, when it closed. Vestiges of this history of producing herbal medicines, including old stone walls and the remains of other Shaker structures, can be found in the Shaker Swamp. The local Forest Legacy project was started around 2005 by the Columbia Land Conservancy. It is being administered by the state Department of Environmental Conservation, which is handling the purchase the conservation easements within the project area. In 2011, organizers of the project submitted a funding application to the Forest Legacy Program, and the funding was virtually secured when the project was ranked ninth out of 69 Forest Legacy applications the U.S. Forest Service received from 42 states. After some concern that the money would be lost when Congress slashed funding for the overall Forest Legacy Program, the funds for the New Lebanon project actually were allocated in 2013. Now the state is in the midst of negotiations with individual property owners to purchase conservation easements for the project. The landowners include Darrow School (a private preparatory school), the Abode of the Message (a Sufi community and headquarters of the Sufi Order International North America), and Berkshire Farm Center and Services for Youth (a therapeutic treatment center and school for adolescents). In addition, private landowners John and Brenda Adams are selling easements to the Forest Legacy project. The landowners will retain ownership of their properties. The easements impose conservation restrictions on the land, limiting future development, and allow for the creation of public-access corridors with trails. The easements do allow for continued use of the land, including some new construction and timber harvesting, by its owners. The parties involved have reached basic agreements in principle. However, the negotiations are still under way, and final agreements have not been reached. Darrow School, for example, is currently waiting for the details of the price and other conditions regarding access, restrictions and other conditions, said Craig Westcott, who is Darrow’s assistant head of school for advancement and external relations as well as the school’s sustainability coordinator. Westcott emphasized that Darrow has a fundamental commitment to environmental sustainability and historic preservation and already manages its lands based on these goals. Meanwhile, the effort to preserve the Shaker Swamp is moving into a new phase. The Shaker Swamp Conservancy has established a set of overall goals, including trails and boardwalks through important areas of the swamp, as well as kiosks and other educational elements. In April, the organization received its first donation of land, a 39-acre parcel along Route 22 that was given to it by Amy Schirmer of Pittsfield, Mass., whose parents had acquired it in the 1980s. The Shaker Swamp project was initiated in 2006 by a group of local residents who believed that the swamp was an important but underappreciated resource. They raised seed money and launched a series of environmental and historical research projects to document the importance of the area. Ted Timreck, a filmmaker and researcher who owns a home in New Lebanon and works for the Smithsonian Institute, produced a full-length digital video to help raise awareness of the swamp and its historic legacy. The group also met with landowners and others in the community to build support. They formed the Shaker Swamp Conservancy as a nonprofit organization in 2012. They have also been coordinating their efforts with the Forest Legacy project. Although the exact boundaries of the Shaker Swamp are open to interpretation, the organization’s Web site (shakerswamp.org) defines the overall area as 495 acres. Darrow School owns a large section of that, and other private individuals and businesses own the rest. The sections that are designated as wetlands are inherently protected from development, but there are areas along the edges and within the swamp area that the group fears could be vulnerable. The goal of the conservancy is to preserve as much of the area as possible, and provide public access to it, through a combination of donations and acquisitions, conservation easements and other arrangements. Organizers emphasize that the overall plan is based on voluntary actions, and the conservancy has been in discussions with property owners on an ongoing basis to consider possible arrangements. “We’re looking at protecting key parcels to connect the dots -- and whatever else we can do to preserve the overall area,” explained John Dax, the Shaker Swamp Conservancy’s board president. The swamp and Forest Legacy projects also reflect other ongoing initiatives to highlight New Lebanon’s legacy and to make the town more of a destination for visitors. In April, the Department of Environmental Conservation officially opened a new 518-acre Hand Hollow state forest in southwestern New Lebanon, with entrances on Gale Hill Road and County Route 9. The Hand Hollow forest is managed for multiple uses, including recreation, timber production, watershed protection and wildlife habitat. Another initiative, called Behold new Lebanon, is entering its second year. That program, described as a “living museum,” involves offering organized visits to local businesses and residents who are engaged in various crafts and enterprises. There is also a plan under way to extend the Corkscrew Rail Trail, which is being developed on a long-abandoned railroad corridor in Stephentown and Petersburg, southward into New Lebanon. NEW LEBANON -- “Once regarded as waste-lands, wetlands are now recognized as important features of the landscape that provide numerous beneficial services for people and wildlife,” according to the Environmental Protection Agency’s website. A pair of Canada geese nest along the banks of one branch of the Wyomanock Creek, as it intersects the Shaker Swamp on Route 22 in New Lebanon. The geese are among many avian species who nest and/or feed in the swamp. New Lebanon has long been ahead of the curve in that regard. Its 400-acre wetland, dissected by two branches of the Wyomanock Creek, was cherished and protected by the Mohican Indians who lived here. They passed on to the United Society of Believers in Christ’s Second Appearing, the “Shakers” — who arrived in 1780, according to the Shaker Museum | Mount Lebanon website — their knowledge of the food and medicinal plants that grow in the swamp. Although there has been some development within the delineated area of the wetland, the state has also reduced the possibility of further development, classifying it as a CA-4 freshwater wetland. An organization of local people, the Shaker Swamp Conservancy, has recently received a donation of 39 acres that will enable it to begin to permanently protect the wetland. 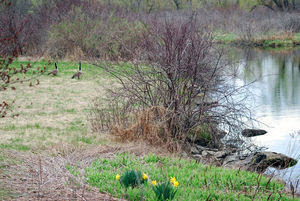 In April, Pittsfield resident Amy Schirmer donated 39 acres of land within the swamp along Route 22 to the Conservancy. The land had belonged to her parents, the late Duke and Martha Schirmer of New Lebanon, according to a press release provided by Conservancy President John Dax. In 2007, the group — the head of Darrow School, the president of the Shaker Museum and Library, the president of the New Lebanon Business Association and the head of the state Parks and Trails, among others — had come together informally and established goals to increase awareness of the swamp’s value as it exists today. In 2011, they incorporated as the Shaker Swamp Conservancy, a 501(c)(3) corporation. It was formed “to preserve the Shaker Swamp and to make this unique and defining asset of the Lebanon Valley available to the public, to promote understanding of this natural resource and its human heritage and to create related opportunities for public education and recreation,” stated the release. The swamp and the calcareous water of the Lebanon Springs that feeds it, as well as the calcium-rich rocks that are found within, provide an environment “conducive to relatively rare herb species, such as purple avens (an anti-inflammatory and antiseptic), mayapple (containing podophyllin, which has been tested as a cancer drug) and blue cohosh (used to induce labor and ease arthritis pain),” according to the Shaker Museum | Mount Lebanon website. “By the year 1850, the Mount Lebanon Shakers were producing 100,000 pounds of dried herbs and several thousand pounds of extract every year for sale,” stated the website. That abundance — and knowledge — germinated the Tilden Pharmaceutical Company, another hallmark in the town’s history. The full report is available on the Conservancy’s website. The donation of the land is a part of the third phase of the Conservancy’s goals: “To acquire property in the Swamp and work toward creating a public recreation site,” according to the press release. They will seek funding “from both private and public sources,” laying the “groundwork by establishing relationships with New York and Massachusetts state entities. “The Conservancy expects to make additional acquisitions of land in the Shaker Swamp in the near future and to present plans to the New Lebanon Town Planning Board for developing public access into the Swamp for passive recreation and educational purposes,” stated the release. The donated parcel, which “abuts the Triple Nickle property, the Nancy Kyle property, the Shed Man property, Route 22 at the bridge over the Wyomonac and the Darrow property,” is a “central part of the swamp,” Dax later told the Courier. The group is “very pleased that this is the first acquisition in our effort to preserve the Shaker Swamp for public education, recreation and conservation purposes,” the release concluded. 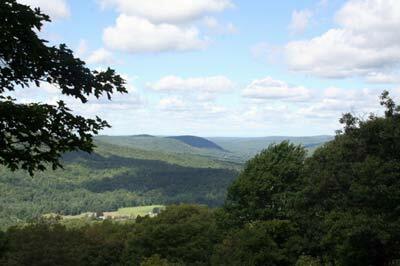 NEW LEBANON/CANAAN -- There are 1,310 acres of land in New Lebanon and Canaan in jeopardy of possibly being developed if funding doesn't come through from the federally-supported Forest Legacy Program to help the Columbia Land Conservancy and several other entities permanently protect this land. CLC -- in conjunction with the Abode of the Message, John and Brenda Adams, the Berkshire Farm Center and Services for Youth, Darrow School and the New York state Department of Environmental Conservation -- are working on the Mount Lebanon Forest Legacy Project to permanently protect this land, which surrounds the Mount Lebanon Shaker Society National Historic Landmark and adjacent Shaker Swamp. According to the CLC, the land includes "scenic beauty, important wildlife habitat and historically significant sites. It also is a potential boost to both the local forestry and tourism economy." The project, states CLC, supports several goals of Canaan's Strategic Plan and New Lebanon's Comprehensive Plan, as well as goals articulated at the state and national level. However, the House Appropriations Committee passed a Fiscal Year 2013 Interior Appropriations Bill that slashes next year's funding for the Land and Water Conservation Fund by 80 percent. The LWCF makes Forest Legacy Projects possible, so funding cuts would "effectively eliminate funding" for new projects, including Mount Lebanon. According to CLC, earlier this year, a national review committee from the U.S. Forest Service reviewed 69 Forest Legacy applications from 42 states seeking a total of $168 million in funding. President Obama's proposed Fiscal Year 2013 budget includes $60 million for the Forest Legacy Program and a proposed list of 20 projects; Mount Lebanon is ranked ninth. A Shaker dam is just one of the many facets of the Mount Lebanon Forest Legacy Project that will be protected if federal funds come through. CLC is hoping enough federal money is budgeted to fund at least the top nine projects so that the Mount Lebanon project can be approved for funding. CLC submitted a grant application to the Forest Legacy Program last November seeking funding to, in part, purchase conservation easements on the 1,310 acres on the four separate properties owned by Darrow School, the Abode, Berkshire Farm and John and Brenda Adams. This project is "part of our long-term conservation vision for Columbia County," according to Michael Chameides at CLC. "The Taconic Ridge has been a priority area for protection in the New York State Open Space Conservation Plan since its inception. The Shaker Swamp was added as a priority for protection during its most recent update [in] 2009." Additionally, the mountain range and swamp have been identified as a significant biodiversity area by the state DEC Hudson River Estuary Program, states the CLC. According to CLC, this project -- the only NYS Forest Legacy Project in this year's budget -- has received the support of federal representatives. A representative for Congressman Chris Gibson stated that he has "met with the Columbia Land Conservancy about [this project] and is a strong supporter of conservation programs." When the House Agriculture Committee, which Gibson is on, considered the 2012 Farm Bill in July, he worked with a bipartisan group of his colleagues to ensure conservation initiatives were protected. However, noted Gibson's rep, the appropriations cut is only proposed and has not yet been considered by the full House. "Moving forward, we will be working on both the authorization and appropriation side to protect the Forest Legacy Program and the Mount Lebanon project," stated Gibson's rep, adding that the congressman is working against the appropriations cut. Mount Lebanon, stated CLC, is part of the Taconic Mountain Range that straddles the New York, Massachusetts, Connecticut and Vermont borders. Prior to 1760, the Mahican Tribes inhabited the area and used medicinal plants and waters found in abundance in Lebanon Springs. From 1785 until 1947, the Mount Lebanon Shaker Society inhabited the area and established what became the largest and most industrious Shaker community, as well as the spiritual center of Shaker society in the United States. Mount Lebanon was registered as a National Historic Landmark on June 23, 1965. It was also recently designated part of the new "Shaker Historic Trail" by the National Park Service and is part of the NPS National Register of Historical Places Travel Itinerary. If funding falls through, "development is a significant possibility," said Chameides. "The properties are highly desirable for weekend/second home development and are bounded to the north and on the south by two large, multiple-lot residential developments. Unless we secure permanent conservation agreements, these properties could become developed and the landscape fragmented." This is where your support is crucial. The Columbia Land Conservancy is encouraging supporters of this project to contact Gibson and Sens. Kirsten Gillibrand and Charles Schumer to ask them to reach out to their colleagues on the Interior and Environment Appropriations Sub-Committees and implore them to include at least $35 million in funding for the Forest Legacy Program in 2013. (The Mount Lebanon Project has requested nearly $1.9 million). Gibson can be reached at (202) 225-5614, Gillibrand at (202) 224-4451 or Schumer at (202) 224-6542 or via email through their government websites. Chameides added that if they are unable to secure the funding, which is their best and possibly only option, CLC "will continue to work with our partners to conserve the area." According to the CLC, the successful implantation of the Mount Lebanon Forest Legacy project would be an investment in critical working forestland, wildlife habitat and natural resources that will benefit generations to come. The Town of New Lebanon has a rich history that includes the Shakers, groundbreaking industries like Tilden Pharmaceuticals and environmental wonders like Lebanon Springs. One particular piece of the town's landscape, the nearly 500-acre wetlands known as Shaker Swamp, ties together those aspects of New Lebanon's past. Believed to be a place where Native Americans and the Shakers harvested plants for medicinal use, the Shaker Swamp is home to hundreds of plant species. Inner portions of the swamp hold species not native to the area that remain much as they were hundreds of years ago. The Tilden family settled on the north end of the swamp and, using the same technologies employed by the Shakers, started the first commercial drug company in America. Now, a group comprised of local citizens and business leaders is looking into how this historic parcel can be a bridge from New Lebanon's past to the town's future. "We started thinking how could New Lebanon take advantage of its vibrant history and bring it alive?" said Karen Ross, a community volunteer chairing a committee studying the possibility of Shaker Swamp becoming an educational tourist site. "There has been a lot of partnering and discussion so far. There seems to be enough pieces of the puzzle so that we have the ability to maneuver and find a way to bring this incredible local treasure to light. It's very much like unearthing a treasure." Interest in the Shaker Swamp, which lies in the area abutted by Routes 20 and 22 and Darrow School, was reignited in large part by a film called "Medicinal Wetlands." Filmmaker and researcher Ted Timreck, who has lived in Lebanon Springs more than 20 years, produced the film he released in 2009 and continues to update the content. Timreck works at the Smithsonian Institution, where he holds a research position in Native American anthropology. He has done research in the Lebanon Valley since it has a rich Native American history. Timreck also has worked with archeologist Steve Oberon (profiled in last month's Chatham Press), another local history buff. Their conversations together, and with Shaker Museum and Library's research director Jerry Grant, eventually led to the topic of Shaker Swamp. "As you start looking at the history you realize hey this was quite a place 100 years ago,'" said Oberon. "For the three of us it's hard to separate the personal and professional - we really live what we do." Given his background, Timreck was first attracted by the Native American connection. "It's been an urban legend all of America's life that Indians taught colonists about medicinal plants. But there is no apparent example or proof that this transaction actually takes place," noted Timreck. "Except in the Shaker Museum's library, where there are records indicating Shakers and Indians were conversing around medicinal plants in the swamp. Because the Shakers were actually comfortable with the Indians they could have these exchanges. "This caught my attention because this is one of a few places where you have an historical record of an exchange. This is incredibly big news." Timreck finds the Tilden part of the story interesting as well. "Tilden was like the grandparent of the modern movement in alternative medicine. Essentially in our backyard, in our town, you can get the entire history of how modern medicine developed." The Shaker Museum and Library sponsored the making of "Medicinal Wetlands." The Museum is in the midst of a long-term project to move its extensive Shaker collection to historic Mount Lebanon, formerly a principal Shaker community located next to Darrow School. So the Shaker Swamp is an important link for the Museum as well. "The swamp is a critical part of the Shaker story, and is a critical physical link between the town and the Shakers," said David Stocks, president of Shaker Museum and Library. "We're very supportive of protecting this swamp. There are limitless ways the swamp can be educational in addition to being a great natural resource." Though the Shakers at Mount Lebanon were meticulous record keepers for the most part, the records are not as prolific prior to 1830 as they are after that date, said Grant. In all likelihood the Shakers started using plants from the swamp between 1800 and 1820. Shaker elder Edward Fowler told the American Journal of Pharmacy in 1852 that his Society had begun cultivating medicinal plants and trading them about 50 years prior. Fowler said: "of indigenous plants, we collect about two hundred varieties." Other sources, such as a New York State Museum handbook from 1933 entitled "The Community Industries of the Shakers" refer to the Shakers' early use of herbs that "grew wild in the surrounding fields." Grant said the Shakers at Mount Lebanon gradually acquired more land toward Route 22 and the swamp area. By 1824 they had constructed a gristmill on Route 22, and a road around the swamp's edge connected the mill with the Shaker site. The Shakers were definitely using the swamp's muck and other stuff, he added. "It's clear the Shakers were harvesting stuff from swamp. They had a botanical garden but they were also going out and gathering herbs and barks and roots. But documenting it is going to take time; there are still a lot of unknowns," Grant said. "The important part is going to be looking at the Shaker pharmacopeia and seeing what plant materials they were using and having experts determine which ones were in the swamp." A book called Shaker Herbs by Amy Bess Miller mentions Native Americans working with Shakers. The author cites an 1807 letter from David at New Lebanon stating: "The Indians are here helping, mostly bringing botanics from the fields and woods." She also quotes an 1842 journal indicating that Indians attended Shaker meetings. Dare We Say  "Revitalization"
Many of those involved in the initial stages of the Shaker Swamp project believe it could be an economic revitalization engine as well as a way to unite the community. In recent years, New Lebanon has hit rough waters, first with the closing of the area's largest employer, Ceramaseal, then the shuttering of the only grocery store in town and the closures of other small businesses. But the former Ceramaseal building was recently purchased, a new grocery store is coming to town, and the Lebanon Valley Business Association has taken an active role in exploring other ways to revitalize the town, including capitalizing on the rich, local history. "It's all tied together. I think the past really serves the present right now and is part of the key to community revitalization," said Oberon. Oberon noted the various ways in which the Shaker Swamp might interest the general public. Besides the medicinal/healing and historic aspects, there is the possibility for birding and the various plant, animal and biological aspects. If an idea being floated of building a boardwalk through parts of the swamp becomes viable, the swamp could provide a quiet place for a nature walk or personal meditation, too. "If we made the swamp accessible on different levels...people would be able to enjoy the different aspects. And in a way it dovetails into the idea of historical tourism, which has helped revitalized various communities," said Oberon. "What I really like is it brings so many different things together in the community. And it's a source of community pride. This can be a resource for economic upturn, and show that history isn't just some arid thing that's nice to know but doesn't have any further role." While there is plenty of excitement and support around the Shaker Swamp project (the swamp property is owned by several different entities who are so far in favor of the project), there is still plenty of work to be done before dream becomes reality, noted Karen Ross. The local committee has been talking with Columbia Land Conservancy about the conservation aspect and how to make sensitive environmental areas accessible. Timreck visited and filmed the Constitution Marsh Audubon Center and Sanctuary on the eastern shore of the Hudson River, in Garrison, NY, where a boardwalk exists. The Lebanon Valley Historical Society received a grant to further study Tilden Pharmaceutical history and Timreck is delving more into the Native American connection. Luckily for New Lebanon, the area is home to plenty of people with expertises related to the project and so far they have been willing to volunteer. But in the long run, funding will be needed and it will not come from local tax dollars, said Ross. She said plans are underway to file for non-profit status so grants can be sought. Plus, additional research needs to be done to tie all the aspects together. "I would say there's a very high level of enthusiasm for making Shaker Swamp something that would draw tourists. But there has to be something to see and learn. It's definitely a long-term project but there is money available for preservation of watersheds, construction of trails, etc.," added Ross. "It's not impossible; it's not like there is a brick wall in front of us. 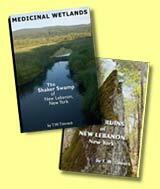 "New Lebanon's unique convergence of religious idealism, and the connection in unknown or unstated ways to the landscape and water, certainly makes for a great story if it can be uncovered and told. People here are really connected to the past, and that's a nice thing. This is something that can bring the whole town together."